With the end of our sailing season approaching quickly in the Great Lakes, the Warriors have taken every opportunity to hit the water on Grand Traverse Bay. There’s a lot to report from the last 30 days of sailing, here are a few of the highlights. 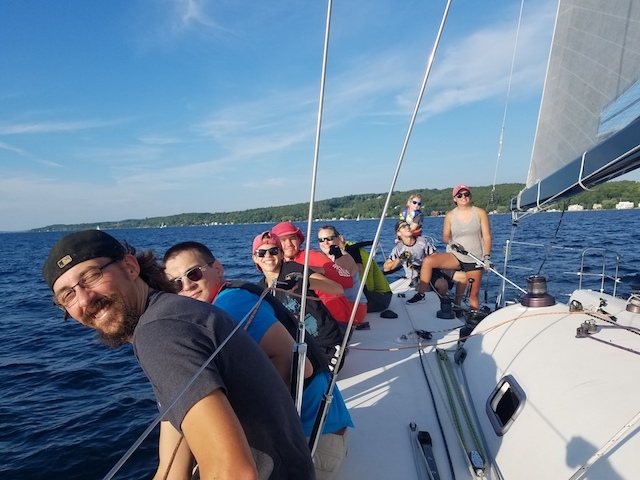 The coaches from Northport Youth Sailing School wrapped up their summer session with a tour of the Warrior 53 in Northport with Ben Poucher and we invited them to sail with our Warrior 43 crew during our Wednesday Night Series Race. Coach Elsie, our guest helmswoman for the night, did an excellent job on the tiller and the smile on her face said it all. This race was the “opportunity of a lifetime” for Elsie and the rest of the coaches from Northport and our Warriors did an awesome job teaching our guests how to sail on a much larger boat than they are used to. The Red Fox Regatta on Lake Charlevoix challenged Warrior Sailors with unpredictable weather. Page Sikes, Josh Agripino, Scott Ford, and Coach Reed Cleckler held on (literally) during a lightning storm and heavy winds to take 3rd overall in the J22 Class of 9 boats racing one design. The biggest take away from this event is the amount of confidence that the crew now has in sailing in difficult conditions. If they can sail through a storm like that and compete, everything else seems like a day sail. The Charlevoix Yacht Club has extended an invite to Great Lakes Warrior Sailing to return to sail in October and November in the J22 one design fleet, stay tuned for more details on that adventure in the coming months.